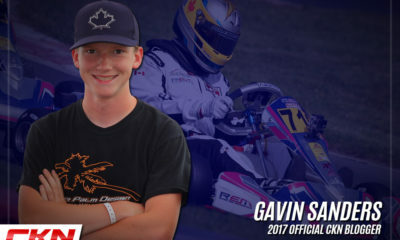 Gavin Sanders: “Teamwork makes the dream work!” – CKN | CanadianKartingNews.com | Because Karting is a way of Life! This past weekend was the second round of ECKC at Academie Jim Russell in Mont-Tremblant, QC. I personally was very excited for this event because this track is extremely fun to drive and very fast with the SUPER long backstretch and a mix of tough corners to master. Plus, the fact that after round one there were many people in the hunt for the championship and thankfully I was one of them. 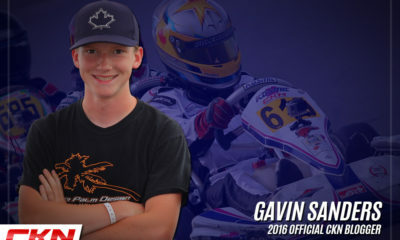 Before I start my recap, I want to give a massive thank you to everyone under the Racing Edge Motorsports tent. The support, advice, help, and setups in the never-ending changing conditions was critical to my success. Also, to my competitors in Briggs & Stratton Senior who kept me on my toes all weekend and pushed me to give it 100% in every session, no matter the circumstances. To start, the vibes this weekend were very good. A successful round one left a fight for a title in every class under our tent, so we were ready for an awesome round two. Once again, my favorite line “teamwork makes the dream work!” was put into action and the whole team was ready to put everything out for each other to make sure things went smoothly. 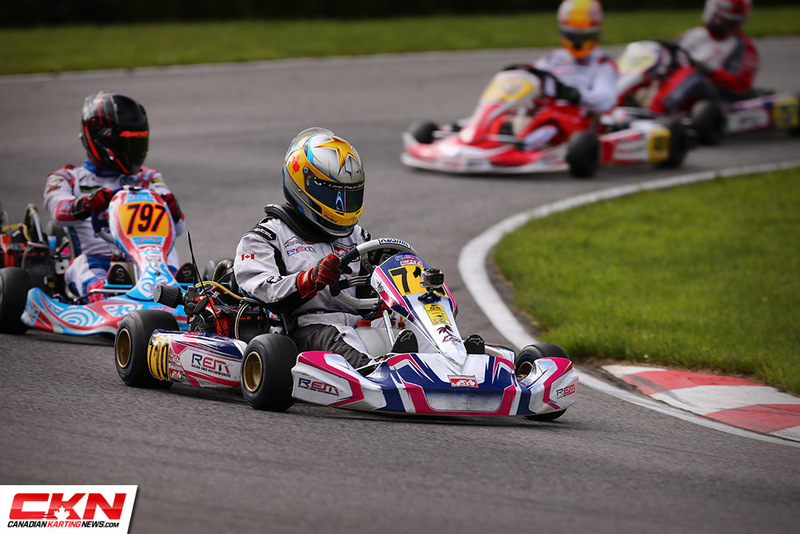 So to the racing, my ECKC Goodwood podium had helped me gain plenty of ground in the championship and I was hoping to gain a little more this weekend to get right up with the front-runners. Saturday morning was wet and dry. I can honestly say that I think I could change from a dry setup to a wet setup with my eyes closed after this weekend’s conditions. 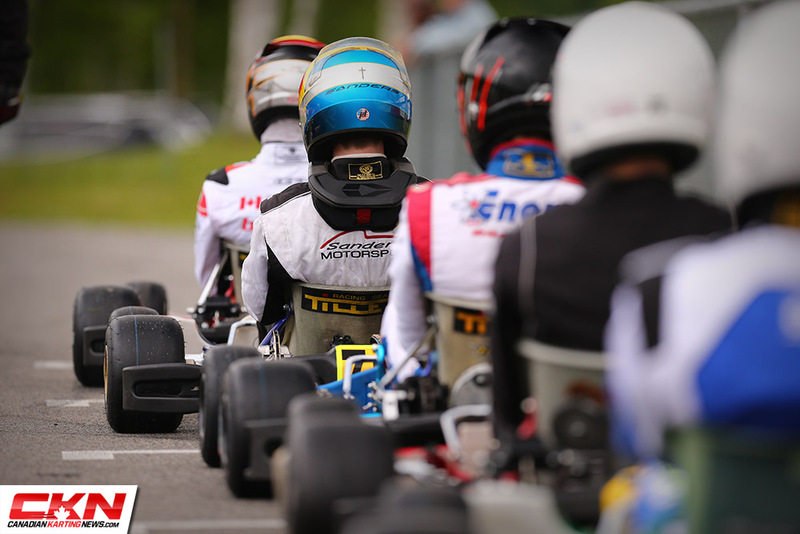 Starting from P4 for the Prefinal was a solid performance and after a good start, I was P1 at the end of lap one. After the pack shuffled out, it was just a two man lead group, one of the karts being myself. It stayed that way until close to the end of the race and then I had a great battle on the last lap, finishing the Prefinal in P2. For the Final on Saturday, there was rain on the horizon but thankfully the weather held off and it was partly sunny for the final. I got an average jump off the start but landed in P3. I worked all race long to keep the veteran teammates, Marco Signoretti and Alex Da Silva, from pulling away from me. By the end of the race, Alex was just too far out for me to catch up and I finished a very positive P2. Sunday started out a perfect day for dry racing but it didn’t last. For qualifying, we planned to work as a team and get to the front as a group. Unfortunately, we ran into a few karts trying to join our draft that left me P12 on the grid, with my work cut out for me. Thankfully, the skies darkened and it started to pour rain just before the Prefinal. I like to think of rain as an opportunity so I was excited about the chance to make up as much ground as possible. Unfortunately, I found myself caught up in an accident at the end of the back straight, with a long road back to the front. Luckily, we nailed the setup and I was able to close the gap somewhat. I ended the race with the pack fighting for seventh after being down in 15th! After penalties were assessed, I was starting ninth for the final. The unpredictable weather continued to provide us with doubt in the setups as we prepped for the final. The rain stopped but dark clouds continued to loom with forecasters scheduling it to be on us in 15 minutes, just before the DD2 final. The pressure was on for all of the competitors and the setup was going to be a major gamble. The tension was high throughout the paddock and everyone had their impact drills, gears, and both wet and dry tires at the ready just in case the skies decided to open up over the track once again. The Senior Briggs final, the last race of the weekend, was nearing and it looked like it was going to be a dry race but the radar was saying it was going to start pouring in the very near future. With time running out, we opted for the dry tires and crossed our fingers. My start was solid. I gained multiple positions and by the end of the lap, I was in the second group as the leaders began to pull away. I moved to the lead of the second group and set my sights on getting back on the leader’s bumpers. After grinding out a fast first half of the race, the leaders began to mix it up and I immediately went on the attack, attempting to get in and battle for a podium. As soon as I got up to the group of third, fourth, and fifth, I launched a great run down the inside to push it three wide along the backstretch. I was able to put myself in a great position for a perfect second half of the race but I wasn’t able to complete the overtakes and ran wide, allowing most of the pack I had behind me through. In the end, I was able to complete the race with a sixth, an identical weekend to my Goodwood race results from just two weeks ago. 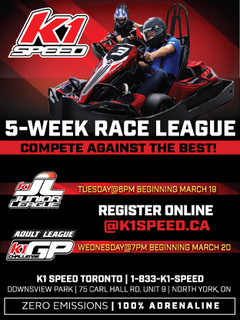 We are now looking ahead to Mosport in July. 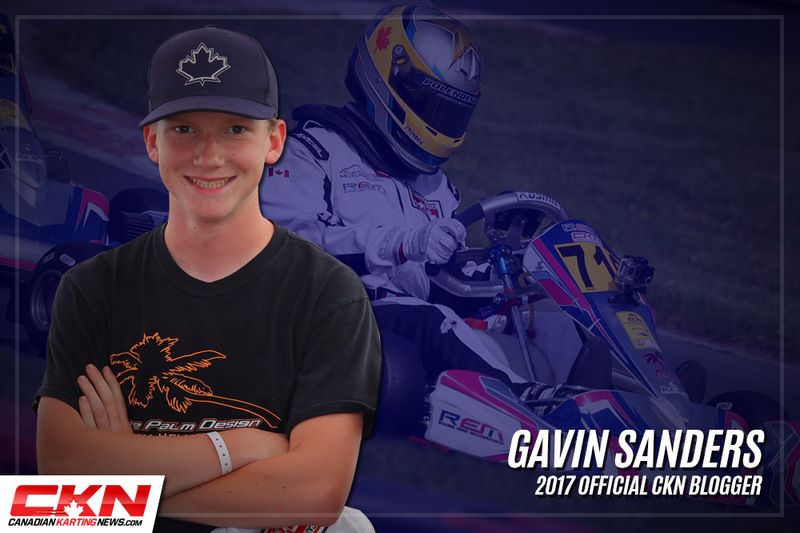 With multiple drivers battling at the top of the ECKC standings, I’m excited to still be in the running, thanks to my results this weekend. 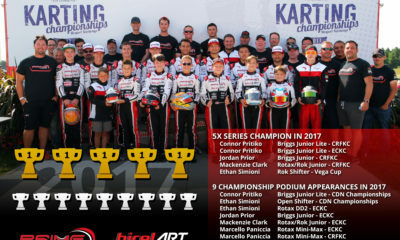 I hope the Mosport numbers are back to the ECKC standards of 30-plus kart fields and mighty rivalries between drivers for the most coveted series in Canada. Hope to see everyone in about a month at the finale!